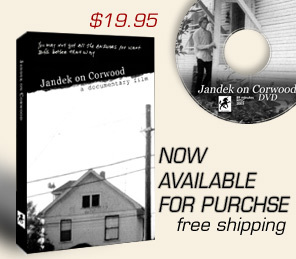 If you attended a Jandek on Corwood theatrical screening and received a coupon similar to the one above, you are entitled to $5 off the purchase of the Jandek on Corwood DVD. 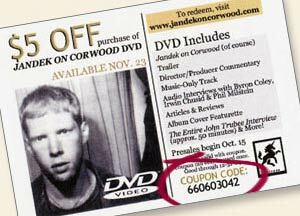 1) $5 OFF COUPONS can only be redeemed with orders placed through the Jandek on Corwood website. 2) Only one coupon is good per DVD. In other words, if you have two coupons, you can receive $10 off, but only if you purchase two DVDs. And if you have one coupon and order two DVDs, the $5 discount will only apply to one of the DVDs. 3) Each coupon can be used only once. The coupon code is voided after its first use. 4) Offer is not valid on wholesale orders. When you order your Jandek on Corwood DVD(s), type the 9-digit “Coupon Code” on your coupon in the “Coupon Code” field on the order page. You will be charged the non-discounted price for the DVD ($19.95). Don’t worry, this is normal. We will then process the order and refund $5 to your credit card/bank account within a day or so. Basically, you’ll be getting a near-instant $5 rebate applied back to your card/account. Just send the Coupon in with your order form and adjusted payment. Be sure to take the $5 off of the payment that you send in.